Pedro Méndez-Carvajal (Oral presentation, April 24, 2010). 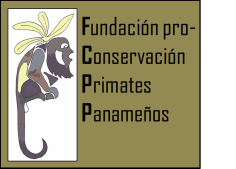 Primates Conservation Activities: Azuero Peninsula In: What is Primate Conservation? Confference of the 10th Aniversary of the MSc. of Primate Conservation, Oxford Brookes University, Oxford, UK. 35-36. To obtain baseline data for conservation planning, we carried out a population survey of two critically endangered, endemic primates, the Azuero howler monkey, (Alouatta coibensis trabeata)and the Azuero spider monkey, (Ateles geoffroyi azuerensis), in the Azuero Peninsula, southwestern region of Panama, Central America. Both of these sub-species are currently threatened by deforestation, poaching, and the illegal animal trade. The study area covered potential primate habitat in all three provinces in which these primates occur (Herrera, Los Santos and part of Veraguas). Surveys were conducted to determine presence and location per province for both species, neither of which had been surveyed before at the population level. A total of 7,821 hours was spent in survey activities using four methods: 1) Direct observation of presence/absence of one or both sub-species; 2) triangulations; 3) strip-transect censuses; and 4) road counts. The combined data showed that 43 groups of Azuero howler monkeys were counted directly, totaling 433 individuals and averaging 9.6 individuals/group (range = 3-26). Overall, it was estimated that approximately 322 howler groups and 3,092 individuals remain in the wild in the three provinces. 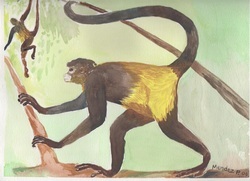 For the Azuero spider monkey, 39 individuals were counted directly with four sub-groups observed, averaging 6.2 individuals per sub-group and 12 individuals per complete group (range = 3-14). It was estimated that a total of 23 groups (145 individuals) of A. g. azuerensis remain in the wild in the three provinces. This study revealed critical conditions for both sub-species, each of which appears to have already experienced changes in social structure due to isolation and habitat degradation. Conservation efforts based on educational methods are currently underway to try and improve future prospects for both subspecies.